Many patients who are admitted into hospital with fragility fracture to the femoral neck are on warfarin for associated medical comorbidity. This can lead to delays to their surgery whilst undergoing reversal of their warfarin. This article reviews management of these patients in one trust. There was concern that many patients who were admitted with fragility fracture to the femoral neck who were on warfarin for associated medical comorbidity were experiencing delay to their surgery whilst undergoing reversal of their warfarin. Warfarin works as an anticoagulant through its inhibition of the production of the vitamin K dependent clotting factors II, VII, IX, and X by the liver. The effects of warfarin can be overcome with administration of Vitamin K either via the intravenous or oral route as this allows the synthesis of new functional and non-inhibited clotting factor proteins.5 Where Vitamin K is administered the effect occurs more rapidly when given intravenously with reported normalisation of INR within 4–6 hours. This effect can take up to 24 hours when given orally.6 In the absence of life-threatening bleeding the use of Vitamin K is more cost effective than the use of more expensive, but faster acting alternatives such as fresh frozen plasma or prothrombin complex concentrate (Optiplex/ Beriplex) and so is the reversal agent of choice for our pre-operative patients awaiting fixation of their hip fractures. On closer investigation of the management of warfarinsed patients attending our trust with fragility fractures to the neck of femur, it became apparent that there was no clear guideline on the management of patients on warfarin therapy who required hip fracture surgery and that these patients were receiving an array of different approaches to the reversal of their warfarin prior to surgery. We proposed to investigate the extent of the problem by establishing how many of our warfarinsed fractured neck of femur patients were experiencing delays due to ongoing reversal of warfarin and whether there was any pattern in the treatment of these patients. Simultaneously, we introduced clear guidelines on the management of patients receiving warfarin who required hip fracture surgery. We then re-assessed the frequency of warfarin-related delay after introduction of these guidelines to ensure that delay to surgery had improved for these patients. 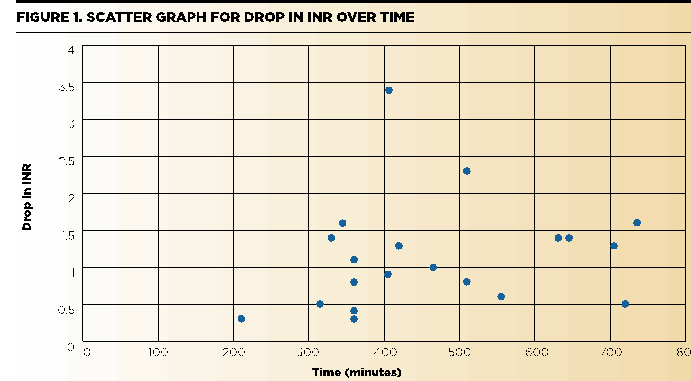 We also investigated whether there was any correlation between duration of treatment with Vitamin K and the drop in INR observed and if so whether there could be any guide formulated that would suggest how long it could be expected for patients at different starting INR to reach an acceptable range for theatre. We undertook a retrospective analysis of all patients admitted to our trust with fractures to their neck of femur over a 10-month period of time from June 2012 to April 2013. Patients on warfarin therapy at the time of admission were identified from our hip fracture database and notes were recalled and reviewed to ascertain whether these patients had required reversal of their warfarin therapy prior to surgery, and what form that had taken. Timing of haematology tests and administration of Vitamin k was noted along with dosage. Where surgery was delayed the reason was noted. Following this first data collection, guidelines were introduced in our trust relating to the reversal of warfarin. A second analysis was undertaken for eight months between May 2013 and January 2014. Notes were again reviewed to establish methods, dosages and timings of reversal therapy and whether any delay to surgery had been experienced. We then used the data from this group to establish the times between dosage of Vitamin K and subsequent haematological tests to establish any correlation between time and drop in INR. Results were reviewed and statistical analysis undertaken using Graphpad software (LaJolla California). 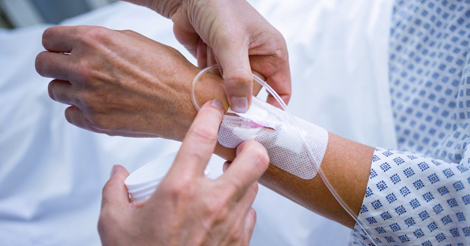 1 further patient received Prothrombin complex concentrate as a second dose in order to try and expedite their surgery, preventing a possible delay. From our first cycle data collection, a total of 40 patients admitted with fractured neck of femur were on warfarin therapy. Thirty-two for atrial fibrillation, four for deep vein thrombosis, one for pulmonary embolus and three for aortic valve replacement. Of those patients, 37 (92.5%) had therapeutic INR requiring pharmacological reversal of their INR. Of those, 37 a total of 21 (57%) were administered a second dose after reassessment of their INR and two patients a third dose of vitamin K to reverse the warfarin. The doses of Vitamin K given to reverse the warfarin and number of patients receiving each dose are shown in Table 1 including where patients required a second dose of therapy to reduce their INR further. The average time from admission to the first INR blood test being sent was 112 minutes (range 30–585 with the average time to administration of first dose of vitamin K a further 246 minutes (range 120–810). When identifying delays for neck of femur fracture patients to theatre we were able to establish that 23 patients (58%) had their surgery delayed due to high INR. In those patients average time to first INR was 120 minutes (range 45–585 minutes), (p=0.78) and the first vitamin K dose at 375 minutes (range 165–810 minutes), (p=0.71). Of those patients with delayed surgery, the first doses of Vitamin K they received are shown in Table 2. Following this data collection, and with the rate of patients delayed due to high INR, we implemented a departmental protocol for all patients admitted on warfarin therapy with fragility neck of femur fractures. The protocol involved assessment of INR within the emergency department and if the level was determined to be >1.5, the protocol mandated the need to administer 5mg of IV Vitamin K with a repeat blood test at six hours post administration to ensure that INR had fallen to an acceptable level (acceptable level determined in combination with anaesthetic colleagues to be INR of ≤1.5). In the second cycle of the audit, a total of 20 patients with fractured neck of femur were admitted on warfarin therapy. Fourteen for atrial fibrillation, two for deep vein thrombosis, three for pulmonary embolus and one for aortic valve replacement. All 20 patients on checking their INR were found to have sufficient anticoagulation to require reversal. On repeat INR check after six hours a further eight (40%) were noted to require a second dose of Vitamin K. This was in keeping with the first cycle (p=0.42). The protocol required that all patients admitted on warfarin receive 5mg IV Vitamin K and all 20 patients in our second cycle received this dose in line with the protocol. This also required a repeat INR test be taken at six hours (360 minutes) post administration of Vitamin K. The average time between administration of Vitamin K and the recheck INR was 467 minutes (range 210–735 minutes). When investigating the timings to first INR test being taken and first Vitamin K dose being administered in the second cycle they stood at 117 minutes (range 15–285 minutes) for first INR and 333 minutes (range 90–1680 minutes) for administration of first Vitamin K. Both of these are improved when compared with the first cycle (120 and 358 minutes respectively), but neither to a statistically significant extent (p=0.68 and p=0.48). In the second cycle only three patients had their surgery delayed due to high INR. This was a statistically significant improvement compared to the first cycle (p=0.0022). We also looked whether there was any relationship between timing of Vitamin k dose and the drop in INR that would help predict the amount of time until warfarin was reversed from when the dose was given. As could be predicted with a drug metabolised and with the interactions and dosage variability of warfarin, we found no reliable correlation (Figure 1). With this study we set out to establish and demonstrated a problem of delay to surgery for patients receiving warfarin and requiring fixation of fragility fractures to the neck of femur. Where no clear protocol for reversal of warfarin therapy existed there was a substantial problem with delays to theatre, but with the implementation of a clear pathway indicating dosage and timings for assessment that we significantly reduced the rate of delays. One study previously demonstrated that reversal of warfarin in neck of femur fracture patients is required and waiting for the INR to normalise on its own is unsatisfactory.7 Another study went further to suggest that Vitamin K is a satisfactory agent for the reversal of warfarin and suggested a use of 2mg IV. However, their patients required an average of 2.2 doses to reach a range appropriate for surgery. When we reviewed the patients who were administrated 5mg IV Vitamin K the average number of doses of Vitamin K was 1.4. Within our analyses we attempted to identify other possible causes for the improvement between our study groups, but it is clear that there was no link between timings of haematological tests or provision of Vitamin K and delays to surgery. Both delayed and non-delayed patients had similar times to both points. Similarly, there was no statistically significant difference in timings between our first and second data collection cycles despite a statistically significant improvement in the number of patients delayed for surgery between cycles. We therefore advocate the use of 5mg IV vitamin K for patients admitted with fractured neck of femur receiving warfarin therapy.